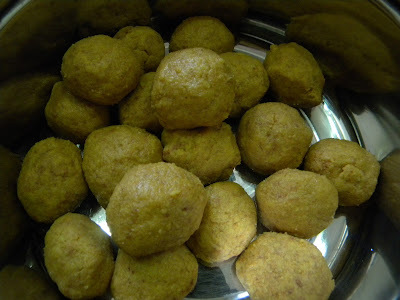 Microwave besan ladoo is a very easy and quick substitute for traditional ladoos in kadhai. You don't have to go for endless stirring lest the besan burns. You can get accolades without going through the grind. They taste absolutely great and you cannot tell the difference between microwave besan ladoo and those made the traditional way. 1. In a microwave safe bowl, mix besan and ghee. 2. Microwave on High for 6 minutes. First stir after 2 minutes, then after 2 minutes, then after 1 minute, then after 30 seconds till you get desired brownness. Let it cool. 3. Add powdered sugar, cardamom powder and chopped nuts. 4. While the besan mixture is still warm and comfortable to touch, make ping pong size balls using your hands. These are now called besan ka ladoo. Store besan ladoos in an airtight container.